Before Ryan became a certified strength and conditioning specialist he was a successful baseball player at the college and professional level playing 3 years with the Kansas City Royals. Ryan developed a love for strength and conditioning through his athletic career as he saw direct results from applying what he learned through school and personal research to his own workouts. His desire to lead others started in college when he wrote the off season conditioning program and taught the workouts to his team due to the fact that his school did not have a strength coach employed. From then, he knew that if he couldn’t play baseball for the rest of his life then this was what he wanted to do. 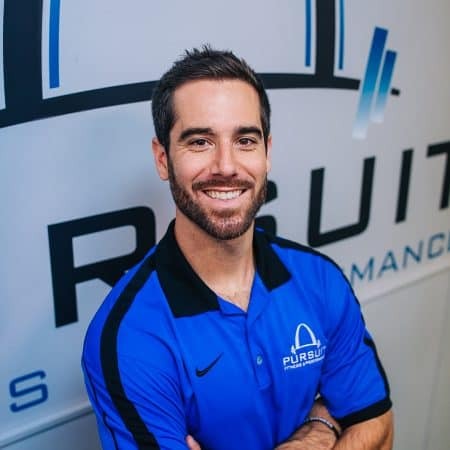 After baseball, Ryan began working as the strength and conditioning coordinator for the St. Louis Pirates Baseball Organization, a premier select team in Missouri that works to advance high school players careers onto college and professional baseball. Ryan also built his own gym in the baseball facility and started training athletes who wanted to take their game to the next level as well as many of the parents who wanted to get in shape. It was during this time that Ryan developed his own philosophy on how to train athletes and the general population, which is where the idea of Pursuit Fitness & Performance was created. Ryan has helped individuals from the ages 15-70 reach goals such as college scholarships, weight loss, pain management and improving and attaining functional movement. Ryan is very active in the strength and conditioning community (studying the latest research on how to maximize performance, identify and correct people’s limiting factors, how to eat in order to stay lean and healthy). His goal is to continually learn from the best people in the industry and stay up to date on the latest research in order to become build the best gym in the country at helping people live a better quality of life. Since baseball, Ryan has developed a new passion which is teaching people how to put a simple plan in place to help them achieve the body and life that they want while creating habits that will extend their life, prevent disease and keep people feeling young. Ryan believes that relationship building is the most important part of his business. He wants to have a genuine connection with each one of his clients in order to create a relationship that fosters accountability, trust and commitment. He believes this is the only way to get long term results.